Janet has agreed to give away a set of these books to a reader who wins this random drawing. Today I am reviewing the “My Danish Ancestor” book. If you are like me and have LDS pioneer ancestry, you probably have some Danish blood. A huge influx of Mormon pioneers came from Denmark to Utah in the mid to late 1800s. They were a hardworking, noble people whose influence lingers to this day. 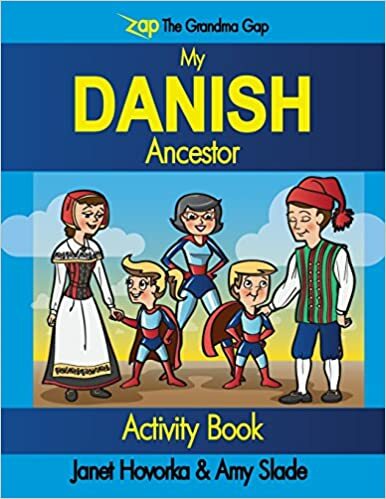 I have often wondered how to get my kids more interested in their Danish ancestry. This book will help me do that! Of course, the first place to start is for me to tell stories about the ancestors. I have forgotten to do that and want to get back to doing that, especially on Sunday nights. If you want to hear one of them scroll down past the video to the end of this post. I have written a story about one of my Danish ancestors down there. I give this book 5 out of 5 stars! If you have any family reunions coming up that involve Danish roots, I highly recommend you get it. It will help your kids understand how they connect to their heritage. Research shows that children who know their family heritage and stories endure stress and trials more happily. Please comment below if you are interested in entering the random giveaway of this book series along with why. The books in the series have similar pages to the ones I listed above. My third-great-grandmother Mica Martine Pederson was one tough, stalwart, noble lady! My kids need to know her story. She heard Mormon missionaries preach the gospel in Denmark. She felt the Holy Ghost witness to her that the message was true, so she got baptized, amidst intense opposition. Despite the persecution, which included mean people pelting her with rocks and eggs as she walked down the street, she held true to her testimony of the gospel of Jesus Christ as restored by Joseph Smith. When she heard that the Saints were to gather in Zion in the Rocky Mountains of the United States, she heeded the call. On the day that she and her husband were to board the ship, her husband announced that he had decided to stay. He refused to move with her. Mica was one determined woman. She knew the gospel was true and decided to give up her husband to follow her convictions. So she left him and took their baby girl. Fortunately she did have some adult companionship as her sister decided to go with her. They arrived in Philadelphia on June 1, 1857. Then they rode the train to get to Iowa City, to join up with a handcart company. Here her sister fell in love with a man and decided not to make the trek west. So with her baby daughter, Hannah, Mica walked across the plains to get to Utah, in the Christian Christensen handcart company. She walked all day, watching her daughter jolt along in the handcart in the hot sun. She ended up falling in love with a young man who was also on the pioneer trek, Clayborne Montgomery Elder, who was from Tennessee. After their arrival to the Salt Lake Valley, they married and settled in Grantsville, Utah. They were then called by Brigham Young to help settle Utah’s Dixie, the southern area of St. George and vicinity. By this time her husband had been married to a second wife to practice polygamy. With the red cliffstone as a backdrop, they made their home on the Virgin River.Tragically, she lost a son to a drowning accident at a sawmill when he was only 14. This was a hard time for her. She relied on her faith to get through. She also had a hard time getting along with her husband’s other wives. Eventually she and Clayborne divorced, after they had moved to Parowan. He had taken to making and wine and drinking. One account of her life that I read says that he left her and moved to northwestern Utah, abandoing her and the children with less than 100 lbs. of flour. Another account says that when he announced they were moving to Milford, Utah, she refused to move with him. We will probably never know the facts until the next life. Mica was a slim, quick woman who was an efficient housekeeper. She grew a profitable garden and made butter, cheese, quilts, and rag rugs, on top of tending to her many children. In addition, she had a spinning wheel and loom. She carded the wool, spun the wool, and weaved the wool into fabric, to take care of her family. She married a second time but then separated after she gave birth to a baby girl. When her firstborn daughter moved to Kingston, this daughter, the one that was a baby on the trek west, invited Mica to come live there. So Mica sold her property and bought some land in Kingston and moved there with two of her sons. They didn’t even own any horses to help work the land. One of the sons bought a pair of steers, so the two boys used the pair to plow the land. Mica again proved to be a hard worker. They raised 200 bushels of grain. They were able to gradually acquire more animals and property and became rather prosperous. Eventually she took on the job of postmistress for the town as well, and a grocery store. She also served as the secretary of the Relief Society. She died in Kingston Utah as a faithful saint and her legacy lives on in a huge posterity.